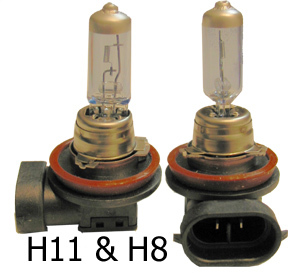 HID Victory Vegas Xenon Gas bulbs DOT approved 55 watt Lo-beam (H11) and 35 watt Hi-beam (H8). This is also used on newer Harley's with the dual bulb Speaker (brand)housing. This is the replacement bulb in Xenon gas for the twin headlight bulb unit stock on all Victory Vegas, Kingpin, and Hammer bikes that come without the HID headlight. This is also on the newer Harley's with the Speaker brand dual bulb bucket. This replaces the Lo-beam in the bike and gives the whiter, blue hue light, similar to the HID light at a fraction of the price. Sold per each bulb. This is the replacement bulb in Xenon gas for the twin headlight bulb unit stock on all Victory Vegas, Kingpin, and Hammer bikes that come with or without the HID headlight. It is also used on the Speaker Company dual bulb bucket on many newer (2006+) HD bikes. This replaces the Low-beam (HID bulb stays on) in the bike and gives the whiter, blue hue light, making the Low-beam look closer to the light in the HID unit. sold per each bulb. This is the replacement bulb in Xenon gas for the twin headlight bulb unit stock on all Victory Vegas, Kingpin, and Hammer bikes that come without the HID headlight. This is also on the newer Harley's with the Speaker brand dual bulb bucket. This replaces the Hi-beam in the bike and gives the whiter, blue hue light, similar to the HID light at a fraction of the price. Sold per each bulb.